On Friday 3 May 2019 from 19h00 to 21h00. Attention: nous ne sommes plus au petit puzzle! On Friday 7 June 2019 from 19h00 to 21h00. On Friday 5 July 2019 from 19h00 to 21h00. On Saturday 8 December 2018 from 13h30 to 16h30. On Thursday 25 October 2018 from 09h00 to 22h00. From Thursday 19 July 2018 at 10h00 to Sunday 22 July 2018 at 18h00. On Friday 6 July 2018 from 19h00 to 21h00. On Saturday 2 June 2018 from 10h00 to 18h00. On Friday 1 June 2018 from 19h00 to 21h00. From Saturday 26 May 2018 at 11h00 to Sunday 27 May 2018 at 18h00. On Saturday 14 April 2018 from 10h00 to 12h00. On Friday 6 April 2018 from 19h00 to 21h00. From Tuesday 3 April 2018 at 14h00 to Friday 6 April 2018 at 17h00. On Saturday 10 March 2018 from 10h00 to 16h00. On Friday 2 March 2018 from 19h00 to 21h00. On Friday 5 January 2018 from 19h00 to 21h00. On Friday 1 December 2017 from 19h00 to 21h00. On Friday 3 November 2017 from 19h00 to 21h00. On Thursday 2 November 2017 from 14h00 to 18h00. On Friday 6 October 2017 from 19h00 to 21h00. On Thursday 15 June 2017 from 18h00 to 21h30. On Saturday 11 March 2017 from 14h00 to 16h00. On Saturday 18 February 2017 from 13h00 to 16h00. On Saturday 14 January 2017 from 14h30 to 18h00. On Saturday 10 December 2016 from 10h00 to 18h00. On Saturday 12 November 2016 from 10h00 to 18h00. On Saturday 8 October 2016 from 10h00 to 18h00. On Saturday 10 September 2016 from 10h00 to 18h00. On Thursday 28 July 2016 from 14h00 to 19h00. On Saturday 14 May 2016 from 10h00 to 18h00. On Friday 29 April 2016 from 19h00 to 21h00. On Saturday 23 April 2016 from 09h30 to 17h00. On Monday 4 April 2016 from 14h30 to 17h30. On Saturday 12 March 2016 from 14h00 to 18h00. On Wednesday 2 December 2015 from 19h00 to 22h00. On Saturday 31 October 2015 from 10h30 to 17h00. From Saturday 30 May 2015 at 11h00 to Sunday 31 May 2015 at 18h00. From Tuesday 19 May 2015 at 17h00 to Friday 22 May 2015 at 19h00. On Saturday 25 April 2015 from 10h00 to 17h00. On Saturday 21 March 2015 from 14h00 to 17h00. On Thursday 19 March 2015 from 16h30 to 19h00. On Thursday 5 February 2015 from 18h00 to 22h00. On Saturday 24 January 2015 from 10h00 to 17h00. On Saturday 24 January 2015 from 09h00 to 17h00. On Saturday 21 June 2014 from 09h00 to 18h00. On Wednesday 18 June 2014 from 18h30 to 20h00. On Saturday 17 May 2014 from 10h00 to 18h30. On Monday 12 May 2014 from 14h00 to 17h30. On Saturday 19 April 2014 from 19h30 to 22h00. From Saturday 23 November 2013 at 11h00 to Sunday 24 November 2013 at 17h00. On Saturday 2 November 2013 from 14h00 to 18h00. From Friday 19 July 2013 at 14h00 to Sunday 21 July 2013 at 22h00. On Saturday 15 June 2013 from 13h30 to 18h00. On Wednesday 29 May 2013 from 18h00 to 22h00. On Saturday 27 April 2013 from 20h00 to 23h59. On Tuesday 26 March 2013 from 14h00 to 18h00. On Thursday 21 March 2013 from 15h00 to 16h30. On Tuesday 19 March 2013 from 14h00 to 16h30. On Wednesday 13 March 2013 from 20h45 to 23h00. On Saturday 17 November 2012 from 10h00 to 17h00. On Saturday 20 October 2012 from 20h00 to 23h30. On Wednesday 9 May 2012 from 21h00 to 23h00. On Wednesday 2 May 2012 from 08h30 to 12h00. On Saturday 17 March 2012 from 13h00 to 17h00. On Saturday 21 January 2012 from 14h00 to 18h00. On Saturday 24 September 2011 from 10h00 to 16h00. From Saturday 14 May 2011 at 10h00 to Sunday 15 May 2011 at 01h00. On Wednesday 6 April 2011 from 14h00 to 18h00. On Saturday 26 March 2011 from 10h00 to 12h00. On Friday 25 March 2011 from 16h30 to 19h00. On Saturday 19 March 2011 from 14h00 to 20h00. On Wednesday 2 March 2011 from 14h00 to 18h00. On Thursday 13 January 2011 from 20h00 to 22h00. On Thursday 6 January 2011 from 20h00 to 22h00. On Monday 13 December 2010 from 09h30 to 18h30. On Friday 22 October 2010 from 20h00 to 23h00. On Tuesday 19 October 2010 from 20h00 to 22h30. On Sunday 10 October 2010 from 13h00 to 18h00. On Saturday 9 October 2010 from 14h00 to 18h30. On Friday 8 October 2010 from 13h30 to 15h30. On Sunday 26 September 2010 from 10h00 to 18h00. On Friday 18 June 2010 from 17h00 to 23h00. On Saturday 12 June 2010 from 10h30 to 16h00. On Saturday 5 June 2010 from 10h00 to 17h00. On Saturday 29 May 2010 from 10h00 to 19h00. On Saturday 22 May 2010 from 10h00 to 17h00. On Saturday 15 May 2010 from 14h00 to 16h00. On Sunday 9 May 2010 from 10h00 to 18h00. On Wednesday 5 May 2010 from 18h00 to 20h00. On Saturday 27 March 2010 from 14h00 to 16h00. On Saturday 27 March 2010 from 14h00 to 18h30. On Saturday 20 March 2010 from 13h30 to 17h00. On Saturday 20 March 2010 from 13h00 to 17h00. On Tuesday 16 March 2010 from 18h30 to 20h30. On Thursday 25 February 2010 from 14h00 to 18h00. On Thursday 17 December 2009 from 17h30 to 20h30. On Saturday 5 December 2009 from 14h00 to 17h00. On Saturday 28 November 2009 from 10h00 to 17h00. On Saturday 21 November 2009 from 13h00 to 17h00. On Tuesday 17 November 2009 from 18h30 to 21h30. Proville Install Party Ubuntu pour fêter la Karmic ! On Saturday 14 November 2009 from 09h00 to 17h00. On Monday 9 November 2009 from 20h30 to 22h30. On Saturday 7 November 2009 from 14h00 to 18h30. On Saturday 7 November 2009 from 10h00 to 18h00. On Saturday 7 November 2009 from 10h00 to 23h30. On Friday 6 November 2009 from 20h00 to 23h59. On Wednesday 21 October 2009 from 18h00 to 20h00. On Saturday 17 October 2009 from 14h00 to 18h00. On Saturday 17 October 2009 from 10h00 to 18h00. On Sunday 27 September 2009 from 10h00 to 18h00. On Saturday 27 June 2009 from 10h00 to 18h00. On Saturday 20 June 2009 from 10h00 to 17h00. On Sunday 14 June 2009 from 09h00 to 19h00. On Saturday 13 June 2009 from 14h00 to 18h00. On Saturday 13 June 2009 from 13h00 to 18h00. 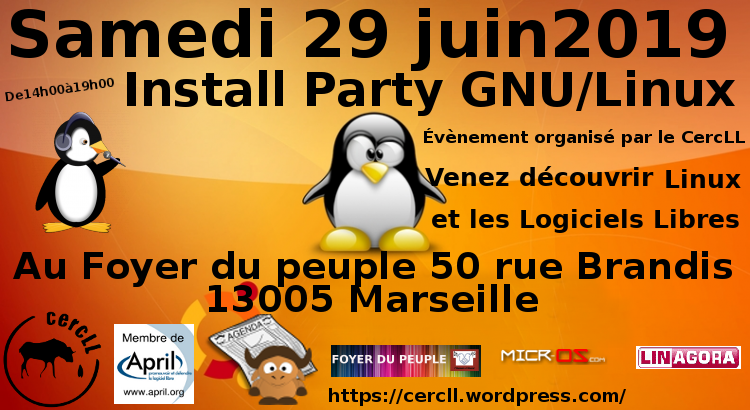 Tulle Logiciels libres et Ubuntu "Install-party"
On Saturday 23 May 2009 from 14h00 to 23h30. On Saturday 23 May 2009 from 10h00 to 18h00. On Saturday 16 May 2009 from 14h00 to 17h00. On Saturday 16 May 2009 from 10h00 to 17h00. On Saturday 2 May 2009 from 10h00 to 18h00. On Saturday 25 April 2009 from 09h30 to 18h00. On Saturday 11 April 2009 from 15h00 to 20h00. On Friday 27 March 2009 from 14h30 to 17h30. On Saturday 21 March 2009 from 13h00 to 17h00. On Saturday 21 March 2009 from 12h00 to 18h00. On Saturday 21 March 2009 from 10h00 to 17h00. On Saturday 21 March 2009 from 09h00 to 18h00. On Friday 20 March 2009 from 14h00 to 21h00. On Friday 20 February 2009 from 10h00 to 12h00. On Thursday 19 February 2009 from 18h00 to 20h00. On Wednesday 18 February 2009 from 18h00 to 20h00. On Wednesday 11 February 2009 from 21h00 to 23h00. On Monday 2 February 2009 from 09h00 to 19h00. On Saturday 17 January 2009 from 10h00 to 18h00. On Tuesday 13 January 2009 from 21h00 to 23h00. On Monday 22 December 2008 from 21h00 to 23h00. On Monday 15 December 2008 from 21h00 to 23h00. On Monday 8 December 2008 from 21h00 to 23h00. On Monday 1 December 2008 from 21h00 to 23h00. On Saturday 29 November 2008 from 10h00 to 18h00. On Saturday 22 November 2008 from 10h00 to 20h00. On Wednesday 19 November 2008 from 14h00 to 16h00. On Saturday 15 November 2008 from 13h00 to 17h00. On Saturday 18 October 2008 from 10h00 to 18h00. On Saturday 11 October 2008 from 10h00 to 18h30. On Friday 10 October 2008 from 20h00 to 23h00. On Sunday 21 September 2008 from 10h00 to 19h00. On Saturday 20 September 2008 from 15h30 to 17h30. On Saturday 28 June 2008 from 10h00 to 18h00. On Wednesday 28 May 2008 from 14h00 to 17h00. On Tuesday 27 May 2008 from 20h00 to 22h00. On Saturday 22 March 2008 from 13h00 to 15h00. On Saturday 8 March 2008 from 10h00 to 18h00. From Wednesday 6 February 2008 at 12h30 to Thursday 7 February 2008 at 19h00. On Monday 28 January 2008 from 18h00 to 20h00. On Sunday 30 December 2007 from 18h00 to 20h00. On Monday 26 November 2007 from 18h00 to 20h00. From Friday 23 November 2007 at 10h00 to Saturday 24 November 2007 at 21h00. Cergy Ubuntu, ou comment réduire la fracture numérique ici et là-bas ? On Monday 19 November 2007 from 20h30 to 23h00. On Saturday 17 November 2007 from 14h00 to 18h00. On Friday 2 November 2007 from 19h00 to 23h59. On Monday 29 October 2007 from 18h00 to 20h00. On Saturday 20 October 2007 from 14h00 to 20h00. On Saturday 20 October 2007 from 10h00 to 18h00. On Sunday 14 October 2007 from 14h00 to 19h00. On Monday 24 September 2007 from 18h00 to 20h00. On Saturday 12 May 2007 from 10h00 to 19h00. On Wednesday 9 May 2007 from 20h30 to 23h59.